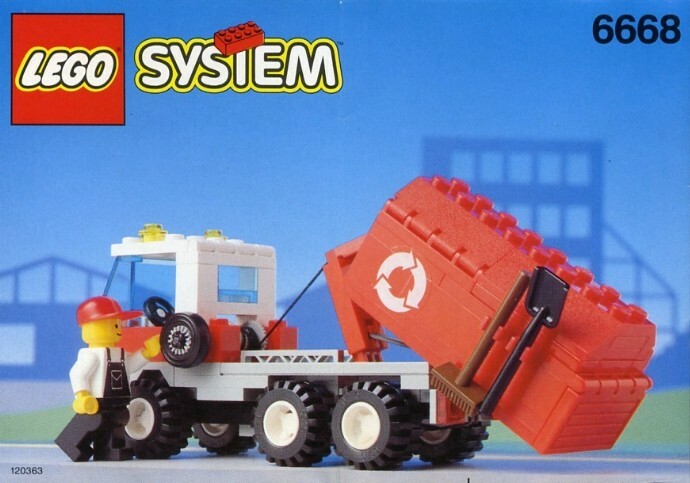 LEGO’s 6668 Recycling Truck from 1994 is one of this writer’s favourite ever sets. Released during the golden age for LEGO Town it looked great, featured the clear everlasting decals that we constantly wish that LEGO still used, and included a neat rubber-band powered container-hook mechanism controlled via a little wheel on the side. Flickr’s Krzysztof Cytacki (aka Dirtzone) has channeled this high-point of the Town range and supersized that humble truck, building a remarkably similar-looking MAN F90 hook truck in Model Team scale. Being a big bit for rubber band power, Krzysztof has chosen LEGO’s Power Functions motors and Technic pneumatics to control his hook mechanism, plus his creation features remote control drive and steering, a raising/lowering third axle, and working suspension on all wheels. It’s a treat to watch in action and you can do just that via the YouTube video below, plus you can check out all of the images of Krzysztof’s MAN F90 truck at his Flickr album by clicking the link above.